I have followed the new "soda ban" in New York City with much interest. Seems many are calling NYC a "nanny state". The "soda ban" is for delis, restaurants, movie theaters, and (my hunch) 7-Eleven. The mayor is restricting these venues from selling a soda larger than 16 ounces. I don't want to go into the politics or details of this law - but I think it brings up an interesting point about beverages. I'm sure most of you know about the "Big Gulp" from 7-Eleven. I have purchased the 32 ounce behemoth when trying to drive long distances and stay awake. No, I'm not proud of the strategy but I honestly never thought I would finish it. The problem is that our bodies do not register calories in beverages. Our stomach doesn't get full when we drink the Big Gulp - the drink just passes right through. All the signals that tell our brain that we are full are missed. So, we just keep drinking and 32 ounces of soda later - we are slurping the end of the cup (and we have to pee). New York City could have easily picked on Starbucks or other iced coffee drink purveyors when they instituted this ban. These drinks can be sugar bombs, and they are large. I paid $4 for a Iced Cafe Mocha the other day because I was hot and I couldn't resist (290 calories). Then, I got to thinking about Mason jars. Why? Because a friend of mine, Steve, was drinking an iced coffee from a Mason jar and I thought it was so cool. Mason jars are hip! What if you pre-made your iced coffee treat so you never go to Starbucks again? How hard could that be? I got out my Mason jar and started brewing. I used unsweetened almond milk for the "milk" portion of the drink because it doesn't spoil like cow's milk and I wanted to make a bunch of these. All you do is brew your favorite coffee (decaf, hazelnut, etc. ), pour it into the jar. Mix in the almond milk and chocolate syrup and store in the refrigerator with the lid. When you are ready to have your treat - dump in some ice cubes and head for your verandah, porch, or couch. Isn't that amazing? Save money, the environment (reusable cup), and calories in one swoop and it is super yummy. Do you have a strategy for sugary beverage consumption? Mix coffee, almond milk, and syrup in jar. Store, covered, in fridge until ready to drink. Add lots of ice cubes and enjoy! How Does It Feel To Drink 14 Cans Of Soda? I agree with you! I also think the not registering we are full signals has been missed in this debate. I do have a 44 ounce cup, I fill with ice tea or water with lemon. I always bring it with me when we go somewhere. In my case might not be the only one drinking it (three kids with me). Sounds yummy! Is it sweet enough? When I stopped drinking pop, I noticed a huge difference in my mood and weight. I can not stand pop anymore, and I used to drink 4 to 5 glasses a day no problem, it is a very dangerous habit (I think)... The iced coffee idea is great! I am a frequent flyer at starbucks, however I am typically pretty lame when I go, my usual drink is a unsweetented iced coffee with non fat milk. I like to buy their coffee vias and make my own iced coffee with almond milk to. I have to try this mason jar idea! I used to do this. I'd steal my kids' chocolate syrup all the time. But I think Hershey's may have HFCS. Nestlé doesn't, I think. Awesome use of the word veranda, my deeeah. I make homemade coffee drinks each morning, saving me the coffee house prices. I brew coffee each weekend and fill a pitcher. Then I pour some of the coffee into an ice cube tray and freeze. Each morning, I use my single serve blender and fill it 3/4 way with cold coffee. I add a few coffee ice cubes, a scoop of my favorite mocha flavored protein and a bit of coffee creamer of my choice. (My favorite is "York peppermint patty") Blend away and soon I have a cold coffeehouse type drink without the high price. Plus, I get an added bonus of some extra protein in the morning. 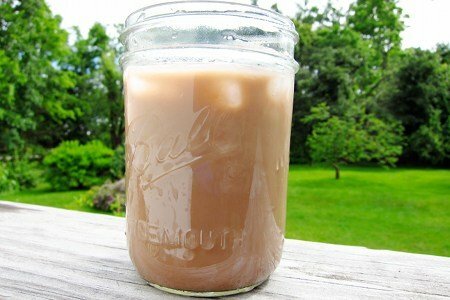 I do make iced coffee this way but I never thought to make a batch and put it in mason jars. AWESOME idea! My go-to iced coffee in the morning is 1-1.5 frozen bananas, ~1 cup cold coffee, and 2 Tbsp cocoa powder, all blended together. The sweetness comes from the bananas and the cocoa powder provides delicious antioxidants! Almond milk must be an acquired taste - at least in coffee! I used it last week when I ran out of milk... not my favorite... But, I'm sure this would work fine with black coffee, then just add your milk & sweetener as you run out the door. Great idea except for the Hershey Chocolate Syrup. First ingredient on it? High fructose corn syrup. Second? Cron syrup, again. Fourth, sugar. View on youtube about the dangers of these sweeteners: SUGAR: THE BITTER TRUTH and in the series THE SKINNY ON OBESITY. Besides, you read in the archives of NYT the articles about sugar written by Gary Taubes. Actually, the law excludes convenience stores such as 7-Eleven, which I think, is crap. I gave up drinking sweetened drinks of any kind when I had gestational diabetes and never picked them back up after my twins were born. Type 2 diabetes is rampant and liquid sugar (of any sort) is one of the big culprits; there is an enormous public health cost given the number of people on medicaid who end up at the hospital with end stage renal failure which is how diabetes kills. I favor the restriction on drink sizes, and I'll have the iced coffee without the Hershey syrup, love the mason jar idea. I like the banana,cocoa coffee idea. I'd like to try that with some vanilla Greek yogurt slightly frozen and blended into a smoothie. Love it! I do the same thing, but sometimes I freeze the coffee and throw it all in a blender than it's like a frappe! I love ice coffee and with the prices of Starbucks, it's great and so easy to make at home. Wonderful post!! I also heard that convenience stores are excluded from the ban. Also, diet sodas are okay to buy at the bigger sizes (I think). However, given all the new evidence that diet soda is also bad for you, maybe it should just be a size ban for all drinks. And maybe there should be a price ban on the cost of a bottle of water! I know going into a convenience store to buy a drink and seeing that a bottle of water is almost as much as any other drink, I'd buy the other drink. Make water cheaper and maybe more people would chose it. Ooh, you should get a Cuppow - I just read about it, it's a plastic lid (made in the USA and BPA free and all that) that you put on a mason jar to make it easier to drink out of. I have been a type 1 diabetic for 47 years. Growing up it was a challenge for my mom to keep the kids happy in a sugar- free world! (no carb counting, etc. back then) She would freeze leftover coffee in ice cube trays with a speck of sweetener and a speck of carob powder. We would drop them in our milk at dinner time and thought it was a real treat. I drink iced coffee drinks now, always with skim milk and a bottle of sugar free chocolate syrup that I keep at my favorite coffee shop. This is the best idea I have ever heard. I'm a coffee sipper and by the time I'm finished with the cup it's cold. Great idea. Will make some this weekend. YUM. And 2 points less than the cappucino I drink- even better. @Kelly - I think it is sweet enough - the chocolate syrup adds about 30 calories of sugar (10 grams or so). The idea here is to try to make a smaller portion of iced coffee so you don't buy the really sugary ones. Thanks for your question! Another suggestion is to use a lean vanilla protein powder instead of milk. This way you are adding a lean protein instead of sugar to your drink. What would be a lean vanilla protein? Do you have a brand you use and like? Have you ever used 'lenai'(len-eye)? They had a lenai on the Golden Girls and we call our patio that (cuz we're high faluten!). Anyway-I am going to give this recipe a whirl this weekend! Thanks so much! I make a small glass of instant coffee and add a scoop of vanila icecream to it along with some ice cubes. You could also try those sugar free syrups to flavor the coffee. I think it is Torani or Da Vinci. They come in a lot of flavors, you could also try coconut milk or sweeten w/ a protein powder which are usually sweet. Every one of you has a great idea! I just don't need that much protein in my diet. GREAT idea....I'm just not a cold coffee kinda girl! It can be 105 degrees outside and I'll want a hot cup of Joe....but, alas....it is still a great idea! Thank you for this! It's so funny that I've never made iced coffee because I didn't have "recipe". Thanks for taking out the guesswork. Snack Girl, I know you have tried Crio Bru brewed cocoa before. If you really want to make a healthy drink, skip the chocolate syrup; use 1/2 vanilla sweetened almond milk and 1/2 Crio Bru brewed cocoa! It's low calorie and good for you! @Marla: Thanks for the tip on the lid for the canning jar. I only have the regular (not the wide mouth) jar, so sadly, it won't fit mine. But, I found that Ball makes a white plastic lid that is sold in an 8 or 10 pack (I forget) that allows me to take a jar with me. I layer Greek yogurt with wheat germ and fruit for breakfast sometimes. Or, I take iced tea on the go. I have never had it leak. Ice coffee has always been my fav drink. I don't too well with coffee, and being lactose intolerant means I have to depend on lactose free milk. I have tried substitute - soy, almond, even rice....it doesn't work. So fat free lactose free milk and coffee when I feel like it. Freezing coffee in ice cube trays?? Brilliant!! Can't wait to try it! heather - I do almost the exact same thing, freeze the cubes, brew coffee in batches and store it. I also have a recipe for homemade frappucinos that I make every once in a while, and use flavored coffee beans. LOVE this idea! Wonder how sugar free Hershey's syrup would work? I'm going to try it! I have become an at home coffee to the point that I prefer my cold brew at home and almost never get coffee out anymore. Mine tastes better and is a lot less expensive. For those of you having trouble adjusting to almond milk in coffee, here's how I weened myself onto it. I started with sweetened vanilla almond milk (it's sweetened with cane sugar), and used a lot, so it was like a latte. Then started cutting back on the sweetened and replacing with unsweetened vanilla and liquid stevia until I was completely onto the unsweetened vanilla. I think it's important to use unsweetened vanilla instead of unsweetened plain. I find it a more satisfactory replacement for cow's milk. As for the chocolate - you can avoid the HFCS by using unsweetened chocolate almond milk (w/ stevia) or make your own. Alton Brown has a recipe for chocolate syrup on the Food Network website. It's easy to make and very tasty. How long does almond milk last usually? How long could you keep this mixture in the fridge? The coffee/banana drink on the 8th post has become my absolute favorite. I add a bit of plain greek ff yogurt for protein and a few shakes of cinnamon. It is the best! Thank you - I get the best ideas from this website! @Rio - Almond milk lasts a long time. Mine is still good after 10 days in the fridge. I have never had it go bad on me. Thanks for your question! I used Walden Mills calorie free chocolate syrup. I used to do this every time we traveled. I would use skim milk back then but will def try w/ the almond milk. I would use a rubber made 1/2 gal or quart container (depending on the length of the trip), place it in the cooler and bring my travel mug. Helped keep us awake and saved a ton of cash! If you are concerned about the chocolate syrup, you can always use Chocolate Almond milk instead. It has a nice light chocolate flavor. I believe you can even get it in the unsweetened variety. Time saver... Put all dry ingredients in mason jar (i use cocoa powder) then when ready blend using mason directly on blendor. Less fuss and dishes!!! Another option for the chocolate syrup would be Wax Orchards syrups/sauces. The are fruit based, without processed sugars, and are amazing! *Serve over ice, or for a frappe drink, blend with 2 cups ice. I recommend the darkest coffee you can find. I am not a dark coffee drinker typically, but when you dilute the coffee 1:1 like this, it can taste much different than a typical coffee drinker's joe. Love your recipes and your honesty and humility, Snack Girl!! Instead of the chocolate syrup, use organic cocoa powder and stevia!